On Saturday, December 5, 2015 BlackShirtReads and the Santa Fe Film Festival (SFFF) will bring an afternoon of drama to The City Different. The two-part event includes a live-performance, staged-script reading of Enchantment, a television drama pilot script, immediately followed by a powerhouse Television Drama Writing panel discussion. High-profile actors Debrianna Mansini (“Awakening in Taos”), JD Garfield (“Breaking Bad”) and Luce Rains (“3:10 to Yuma”) headline an Enchantment cast directed by Vern Gillum—veteran of over one hundred television shows. Along with Santa Fe School of the Arts youth actors, BlackShirtReads (BSR) raises the entertainment bar with a script narrated by Hotel Santa Fe managing partner, Paul Margetson, and musical interludes played by classical guitarist Harry Musselwhite. Early in 2015, SFFF Executive Director NaNi Rivera collaborated with BSR co-founders Kathleen Dexter and Joanna Smith to bring a screenwriting component back to the Festival and they are excited to present a starpower-packed Television Drama Writing Panel that includes Emmy winners Kirk Ellis and Bruce McKenna, Longmire head writer Hunt Baldwin, Star Trek writer Melinda Snodgrass, historian, journalist and screenwriting collaborator Hampton Sides with Santa Fe University of Art & Design professor Terry Borst moderating. Saturday, December 5, 1:00 pm. 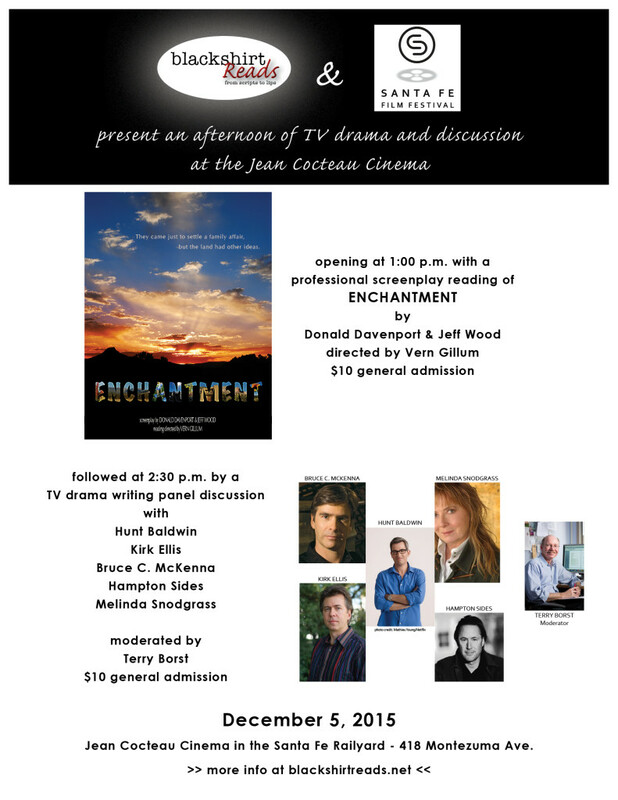 at the Jean Cocteau Cinema, 418 Montezuma Ave, Santa Fe, NM 87501, reading of Enchantment, written by Donald Davenport & Jeff Wood, directed by Vern Gillum. Saturday, December 5, 2:30 pm. at the Jean Cocteau Cinema, 418 Montezuma Ave, Santa Fe, NM 87501, Television Drama Writing Panel. Have a Walt Longmire character wish list? Netflix has just renewed Longmire for Season 5; Hunt Baldwin and the other panelists will be taking questions. Want to know what adaptations are like from both original author and adaptor? Kirk Ellis and Bruce McKenna are both working on Hampton Sides written projects. At the script reading, there should be several producers in the audience, will Donald Davenport’s script get picked up? Julie Richardson (played by Santa Fe celebrity actress Debrianna Mansini), a big city doctor who opted to raise a family rather than practice medicine, is on the verge of accepting a job with a large corporate medical group when she is surprised by the arrival of a mysterious letter from a Santa Fe attorney informing her that she has inherited a small, Northern New Mexico ranch. Curiously, the will specifies that she must take possession of the property in person. Arriving with her family for what is planned as simply a weekend road trip, she discovers that her unknown benefactor is actually her biological father, and she has been unwittingly selected to continue his legacy. BlackShirtReads is an opportunity for screenwriters to workshop their screenplays via professional readings and critique by industry professionals. In January 2016, BSR will be accepting submissions of feature-length and TV pilot scripts. 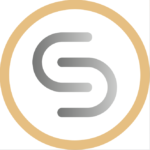 See http://blackshirtreads.net for more information.